But I never regret making them — and I will probably make many more. 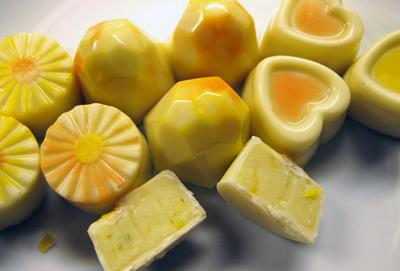 This episode’s chocolates feature a white-chocolate-citrus ganache in a white-chocolate shell. I’ve been wanting to try a citrus ganache for quite some time, so I took the gist of Dede Wilsons’s citrus truffles recipe from her aptly named book, Truffles, and applied it to an oh-so-gently adapted version of Liz Gutman and Jen King’s ganache from their book The Liddabit Sweets Candy Cookbook. I tend to worry about the ganache for molded chocolates being too thick to self-level in the molds, so I always add a little less chocolate than the ganache recipes specify, even if it’s a recipe for ganache destined for molded chocolates. Even with a slightly reduced amount of chocolate in this case (the Liddabit recipe had called for 20 ounces), by the time I was piping the second mold the ganache started to mound a bit. Once the filling starts to mound, it’s harder to judge just how much room is really left in the mold for the sealing chocolate. Of course, one of the best ways to learn that you’re overfilling the molds is to inspect the filling at eye level — if you see any filling sticking out, you’ve overfilled. Using the eye-level peek a little too late in the process, I discovered that at least half of the cavities were slightly overfilled. Stubbornly, I soldiered on. Long story short: the ganache could have used even less chocolate or a tablespoon or two more cream. Oh well. As a filling proper, though, the ganache is great. I’ll always prefer a creamier ganache than what I have in paw, but I was happy with the creaminess of this ganache within the white chocolate shell, at least on day one. It’s day three now, so I should try another!! Taste-wise, the ganache did have a mild and fresh citrus-y taste, but I wish it were stronger. Dede Wilson’s original formula included some Boyajian citrus oils, which, said Wilson, could be replaced by doubling the amount of each type of zest (I actually tripled each amount for the recipe above). But after reading a lukewarm review of the oils, I had decided not to bother to track them down. Maybe I should have given them a try after all. Cacao Barry’s “Blanc Satin” 29.2% cocoa butter white chocolate was a disappointment in both flavor and viscosity. Flavor was all but nonexistent — I expect at least a little bit of vanilla in a white chocolate, but could barely detect any here. And, as a molding chocolate, it’s simply too thick to work with at “working” temperature — I must have added up to 4 tablespoons of Mycryo (powdered cocoa butter) to my four pounds of melted chocolate. This worked well for the shells, which, after three minutes of setting were a perfect thickness — but sealing the molds took a lot longer than I ever thought imaginable — up to 45 minutes for the seal to set, possibly because I did something wrong while tempering. Fortunately, this lag did give me extra time to patch the bottoms of the chocolates for which I had overfilled the ganache. These turned out to be not-so-nice-to-look at from the bottom, but from the top they look fine, though most of the patched bottoms do not sit perfectly flush on a plate. So, all that’s left to cover here is the coloring of the shells. By far I think using a glove-covered fingertip to smoosh colored cocoa butter around the mold before filling it with chocolate works the best, at least this time around. Using a small paintbrush to add the color can work, as I tried in the heart and flower-shaped molds, but you have to get the cocoa butter at just the right thickness for smooth painting without any too-thin color pooling in the bottoms of the cavities. It’s a very short time period within which this can work. The fingertip-application is much easier (you can always re-smoosh if the color starts to pool in the center), and usually looks pretty darned cool. This entry was posted in Chocolate, Confections and tagged "citrus ganache", cacao barry, chocolate molds, chocolates, citrus, cocoa butter, Guittard, molded chocolates, Mycryo, polycarbonate, thinning couverature, white chocolate, zest. Bookmark the permalink.